Earlier this year, Patriots Day arrived in cinemas with a bit of a thud, underperforming at the box office despite solid reviews from critics, which may have been down to the fact that audiences just didn’t want to see a film that so closely re-enacts the tragic Boston Marathon bombing in 2013 and the days immediately following afterward. History has now repeated itself many months later, with another film concerning the aftermath of the bombing doing even worse at the box office, in spite of many reviewers deeming it as one of the best movies of the year (it currently has a damn high Rotten Tomatoes score of 94%). It seems that regardless of the film’s quality, nobody really wants to actively go to the cinema and relive a day that’s still very clear in the minds of many, which is entirely understandable but at the same time, they’re missing out because Stronger really is an extraordinarily powerful movie that deserves to be seen by far more people than it has been. The film is about Jeff Bauman (Jake Gyllenhaal), an underachieving Boston lad who shares a small apartment with his alcoholic mother (Miranda Richardson) and doesn’t seem to take on much responsibility in his job or in his personal life. When he runs into his ex-girlfriend Erin (Tatiana Maslany) who’s running the Boston Marathon, he vows to show up with a sign of support, which he actually does – only to be caught right in the crossfires of the terrorist explosions, which leaves him with mangled legs and what remains below the knee is quickly amputated. Despite being depicted in the media as a hero, Jeff struggles to adjust to life without the use of his legs as well as the traumatic memories of the life-changing event itself, marred by the selfish and negligent nature of his mother, but comforted by Erin’s warm support despite Jeff’s growing insecurities. It stands out amongst just your typical biopic fare because it doesn’t paint the main figure as a perfect individual who can do no wrong, nor does it want to. Before the whole ordeal, we see that he’s a pretty aimless guy who slacks at work, even going so far as to talk his way out of working so he can go watch a Red Sox game with his friends, and doesn’t seem to acknowledge the fact that his family, particularly his mother, is holding him back in ways he probably doesn’t want to admit. Even after he loses his legs, he doesn’t seem interested in bettering his life in any way, which comes as a frustration to the one person who desperately wants to help him, that being his on-and-off-again girlfriend Erin, and it serves as a far bigger personal hurdle to Jeff himself more than even his missing legs. Stronger is a character study through and through, one that is made even more powerful by Jake Gyllenhaal’s incredible performance, which should surely get some attention at the very least this awards season. He gives a very emotional as well as physical performance that has you completely hooked all the way through, and it’s powerful enough that it allows you to completely understand how the character is feeling and what kind of an effect it is having on others around him; he delivers a beautiful portrayal of a screw-up who, through a devastating personal loss, learns to be a better person instead of wallowing in his own guilt. Director David Gordon Green, along with cinematographer Sean Bobbitt, present a haunting representation of the struggles this man is going through, including a devastating one-shot flashback sequence to the immediate aftermath of the bombing with Jeff firmly in the centre of it all. They also, whenever it is required by the script, deliver scenes of raw emotion from just the simplest close-ups on actors’ faces, allowing the audience to absorb their delicate composure that says so much all at once even when it doesn’t seem to be the case. Although the script falls into genre convention once or twice, it never feels out of place nor does it seem to undermine the very raw nature of the journey these characters are going on, and it’s a quiet achievement that deserve recognition beyond simply just honouring Gyllenhaal’s magnificent triumph of a performance. 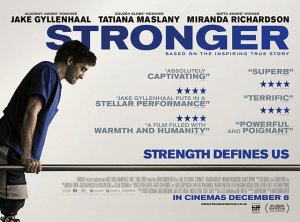 Even if you, like many people it seems, are not too keen on seeing a film centred around a tragic event that happened not that long ago, I would still say you should definitely try to check out Stronger and just attempt not to be caught up in the raw, powerful emotions it can give you. Stronger is a powerfully told, extraordinarily acted and quietly emotional character study of a real-life hero in the wake of tragedy, and defies biopic standards by making us question whether he’s really that heroic at all.